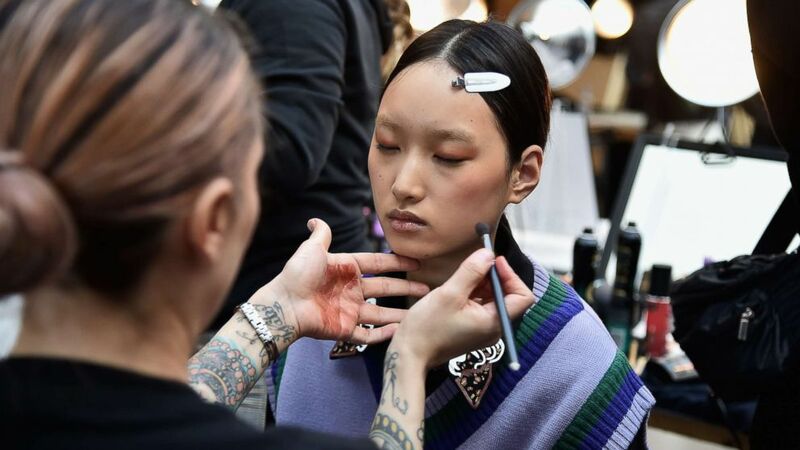 camera (Theo Wargo/Getty Images, FILE) A model prepares backstage for a fashion show during New York Fashion Week, Feb. 8, 2019, in New York. Too busy to book your next blowout? Welcome to the club. The good news is that there are a variety of beauty booking and fashion rental websites that, with just a few clicks, can help you get glammed up from head-to-toe for an appointment or your next big event. This guy is a true style aficionado. Having a glam squad meet you in your home or a designer dress that you can rent ahead of time can make life so much easier. In case you aren't sure where to start or which services to trust, no worries! Below, we've laid out some of the best digital platforms for transforming you into your best self. Back at it & all business (like our NYC artist @eddie_makeup). This mobile app is one of the most well-known booking services for makeup, hair and nail services. You can lock in a stylist to do everything from a $50 blowout to cool nail art, all in the comfort of your own home. Glamsquad is available in New York City, Los Angeles, Miami, Boston, Washington, D.C. and throughout the San Francisco Bay Area. If you're looking for luxury on-location services you can trust, Vensette is for you. The company has provided services for big names like actress Blake Lively as well as VPs like Linda Fargo of Bergdorf Goodman. Vensette is currently available in New York City, Los Angeles, Miami and the Hamptons in Long Island, New York. People love Priv because they can book a variety of inclusive services that cater to lots of different hair textures — there are even men's grooming services. Priv currently serves eight locations, including Los Angeles, New York City, Chicago, Miami, Philadelphia, Washington D.C., Atlanta, Georgia and Austin, Texas. BeautyLynk keeps the needs of women of all skin complexions and hair textures top of mind. Services are available nationwide and you can book everything from braided extensions to curly/natural hair styling. It is "A community of hair, makeup and nail stylists committed to making everyday gorgeous, for everyone," as noted in the brand's Instagram bio. Locations are all across the globe ranging from New York City to London. With a wide assortment of selections from high-end designers, such as Marchesa Notte and Christian Siriano, you can rent clothing for your next occasion by signing up with Rent The Runway. Deliveries and returns are easy, and if you really love a look, you have the option to buy it and keep it forever. This service makes getting dressed a breeze and there are subscriptions available for as low as $69 a month. Stitch Fix allows everyone to feel like a celebrity by providing a personal stylist to take the guesswork out of figuring out what to wear to your next occasion. All you have to pay is $20 for a styling fee and each delivery, which can be credited back toward anything you decide to keep. Wear, return and repeat is Le Tote's motto. With monthly memberships as low as $79, you can shop through lots of classic (and maternity) pieces to ramp up your wardrobe. If you like something, you can buy it for 50 percent off. Making a list?? & dressing up nice ? . #ShareMeGB from @lolo_russell in the Bow Sleeve A-Line Dress by Gabby Skye. Add it to your GB closet today! Gwynnie Bee gives women of a wide range of sizes (0-32) the option to rent an unlimited number of styles. 20% off ALL CHANEL use code CHANEL20 at checkout! Hurry, sale ends 2/22/19 at midnight! Link in bio ?? If you want the perfect clutch to go with your outfit, but can't quite afford it right now, borrow it instead with this service. Just like the name, you can borrow or buy authentic luxury goods at amazing prices so they won't break your budget.